This was reading week and there were no scheduled classes. It’s a balancing act between taking a nice little holiday before the final push and getting enough work done so I don’t feel behind when I get back. I say that with regret because it would be nice to step away for a few days without any of the accompanying guilt. I found that to be especially true with it being the last break before I graduate. I only have to look up from my screen to see the post-it note above my desk that reminds me this last semester is a marathon. It won’t be over quick and it requires continuous effort and pacing to make it. If I put too much effort in too early I’ll be burnt out by the end. If I take it too easy I’ll be struggling to catch up. In the spirit of reading week I've started On Photography by Susan Sontag at the suggestion of my teacher Mitch Kern (to whom I say thank you). It’s hard to believe it was written in 1977 because everything in there is just as relevant to what’s happening now with cell phone cameras and Instagram (among other social networks). Of particular note is this part where she talks about photographs in books and how there is no way to regulate the speed in which they are consumed. I thought this was really interesting. Imagine someone flicking through their Instagram feed. How long does a user spend looking at each photo before scrolling to the next? 10 seconds? 5 seconds? 2 seconds? Perhaps even less? And then I thought about Vine and how things are a bit different. Instead, you are required to watch for a specific amount of time up to a maximum six seconds, based on the medium’s limitations. This structure that requires you to consider something for longer than normal could “increase visual legibility and emotional impact” according to Sontag. Photography is not practiced by most people as art. It is mainly a social rite, a defence against anxiety, and a tool of power. Dependence on the camera, as the device that makes real what one is experiencing, doesn't fade when people travel more. This all seemed to culminate in my visit to Canmore this week (my little bit of vacation time away from schoolwork). I brought my camera and made some pictures but I always had the essays in the back of my mind and this question of “Why? Why am I doing this?” (in the voice of Dieter Rams from the Objectified documentary, no less) Perhaps it will be answered later on in the essays. Perhaps I am totally doomed to question the activity from now on. A small teaser of what’s to come: Laura Sand, Nikki Stephens and I have teamed up with Nicole Edmond, a print media major, to work on a project. 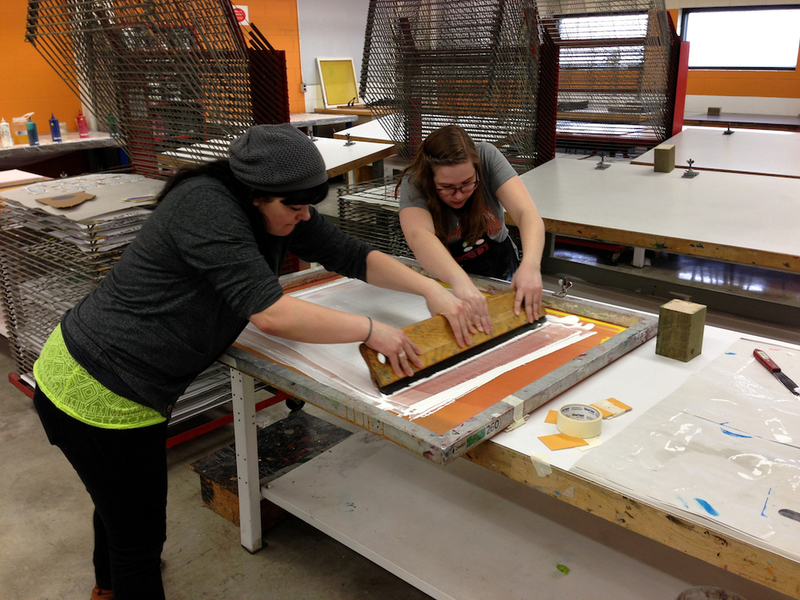 We were in the print studio this week to screen print some artwork onto cardboard. It was a nice throwback to the print class I took in first year and I’m looking forward to doing more stuff like this once I’ve graduated. Here’s some photos from the printing session.